Everyone of us desires to live a life of passion. A life where we are engaged in our work and love what we do. Here are five elements of passion, that may get you closer. After posting the last post, Are You Addicted to Passion, I had readers wondering if I had changed my mind on the subject of passion. One reader asked me if I meant that you could become passionate about any job. The answer to that is no. That approach would deny the uniqueness of our design, the mastery of God’s plan for each of us even before we were born. It is true, my understanding of passion evolves over time as I continue learning, but no, my understanding of passion hasn’t done a 180 degree flip either. I think having a passion for what you do is awesome. 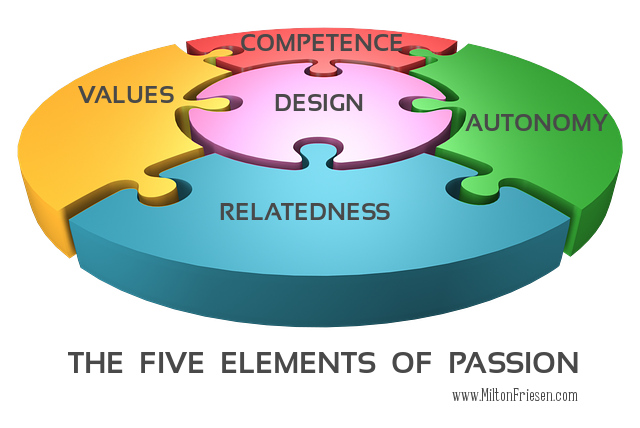 Later in the article, I will introduce five elements of passion. But first, over and over I see this life principle that Jesus mentions prove true: “He who tries to keep his life will lose it, but he who gives his life will find it.” This is my wording of Luke 17:33. Trying to keep our life is selfish, giving our life is about serving. The pursuit of happiness leaves you unsatisfied. Happiness comes to those who are too busy serving others to think about whether they are happy or not. Passion comes to those who become very good at serving others with their talents. Let me borrow from Cal Newport’s book, “So Good They Can’t Ignore You .” He uses two terms in regards to finding work you will end up loving. The first is the Passion Mindset, and the second is the Craftsmen Mindset. The Passion Mindset, he explains, goes around asking selfish questions. What kind of a job will make me feel good? What can I get out of the job? Does this job make me feel alive? These questions invariably lead to dissatisfaction with a job, and cause you to jump from one job to the next in trying to find fulfilment. That is why Passion makes a bad leader to follow. The Craftsmen Mindset approaches work very differently. It asks a different set of questions. How can I use my talents to serve others? How can I become better at serving others? What can I offer this company, this community, this client base? How can I become uniquely great at helping others? These questions challenge growth and cause your focus to turn to others instead of yourself. They challenge you to become great at your talents and put in hours of effort to become great at something. That, in turn, often catches up to you in the form of passion. That doesn’t mean that the person with a Craftsmen Mindset won’t jump around jobs on occasion, but he does it for different reasons. He does it to become better at something, or to try different ways of serving others more effectively with the gifts, talents, and skills he is developing. But the excellence of service approach to life, is far more likely to catch up with you in the form of passion than a passion focused life will. The awareness of your Design. It starts with how God created you. He designed you intentionally before you were ever born. That puts some unique aptitudes, personality traits, and raw skill (mostly in the form of specific interests), into your life. But it is up to you to grow them and develop them. The growth of your Competence. Level of skill. The ability to push yourself and grow your skill to new performance levels. Constantly challenging yourself to learn new ways or better ways of doing things. Staying on the cutting edge. The strength of your Autonomy. Independence and self-discipline. The two together will likely determine how much control you actually experience in your life. Because control is given to the trustworthy. The sphere of your Relatedness. How well you like and enjoy the people you work with. How well you serve, and how relevant your service is to your clients. The symbiosis of your Values. How well each of these areas harmonize with the moral, religious, cultural, and personal values you formed growing up. Don’t pursue passion. Build these five elements of your life intentionally, and let passion find you. Passion won’t be found in the perfect job. Even if you get a job that is a perfect canvas for you to start painting on, passion may well elude you until these five elements of passion grow to greater strength. In your journey as you grow these five elements of passion, you will find your passion increasing. So to begin with, be contented with interest. Be patient. Contentment and patience are virtues too. Joy can be had even in the process of the journey towards passion. Just be intentional in growing these five elements as they become clear to you. Where are you in your journey to building these five elements of passion into your life? Previous Post Are You Addicted to Passion? Next Post What Would Jesus Do?